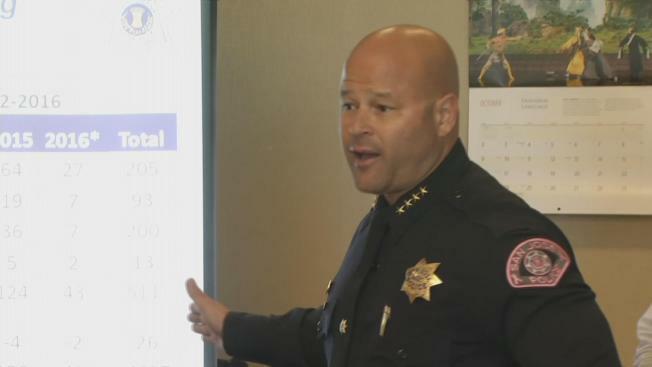 It's no surprise that San Jose's police force has been taxed by a staffing shortage. On Tuesday, city leaders saw the crisis in terms of cold, hard numbers, and those stats may be just the capper they need in their push for an alternative pension reform measure. The new analysis from City Auditor Sharon Erickson, presented at the San Jose City Council meeting, shows that since the benefits cuts from Measure B in 2012, the police force has lost almost 500 officers. And the department's overtime has tripled, with each cop averaging 450 hours of OT. Despite all the extra hours worked, some shifts still see vacancies. "You don't see your family; you come to work, you don't know when you're going home," said James Gonzales, vice president of the San Jose Police Officers Association. "It fatigues your body in a job that really can't take that sort of risk, and you have to be on top of your game." The city auditor agreed officer fatigue is a concern, saying a clear limit on weekly hours needs to be set, and the proper use of sick time needs to be enforced. Chief Eddie Garcia and Mayor Sam Liccardo used the numbers to push for Measure F, a compromise reform bill that would negate some retirement and health care cuts approved under Measure B. "The measure in November makes us more competitive," Garcia said. "That makes the police department better. That's not me opining; that's a fact." Critics of Measure F have said it takes away too many of the cuts approved by voters in Measure B. But now with hard numbers put before them, it'll be up to voters to decide whether numbers don't lie.